The Brisby Tan is a 12-inch tall Men's western boot with a dusty brown leather exterior that's textured and distressed to give this boot a vintage feel. The cream, rust, and denim blue stitching add a pop of color to this retro classic. The square toe and unit heel allow for an easy fit in the stirrup and the cushioned insole supports the foot for lasting comfort throughout the day. This style is proudly Made in the USA with global parts. Got these boots Friday Feb8th. Wore them around the house to test out the feeling of them, felt okay. A little snug, but, okay. Wore them outside for a few hours, noticed that the left boot was CONSIDERABLY less comfortable once I started walking on something other than carpeting. Upon examination, the left boot is markedly shorter than the right. I don’t mean a millimeter, I mean about 1/2 to 3/4 of an inch shorter. Looked at the size of it, says 10 1/2 in both boots. There’s also a piece of material that sticks into my foot in the left boot.Overall, pretty disappointing purchase. Could’ve spent 200.00 plus elsewhere for a better quality boot. I bought these boots a couple days ago from Langstons in OKC, OK. At first glance at the store everything seemed fine. Took the chance on them.The overall appearance and structure of the boot are well designed. The inner sole padding is comfortable on my foot. I will admit.With that in mind: There are significant issues with the interior stitching on the pull straps - rendering these boots very uncomfortable. I have scratches on my legs from them. There are several defects in the outer stitching on the upper shaft of the boot, now that I had a chance to examine them more closely. In the interior of my right boot - the inner seam sticks out and rubs on my foot which also adds to discomfort. There is residual glue where the outsole meets the leather of the boot.I am disappointed at the quality of these boots.I trusted Nacona to make a better boot than the other brands out there. From my recent experience with my purchase - I have been let down.I will be attempting to return them but Langstons is fairly unhelpful when it comes to returns - for good reason.Their quality team should be ashamed. Hey there. Thanks for letting us know. Please give us a call at 1-800-548-1021 and we`ll work with you to find a solution! I'v been wearing this boots every day for six straight years. The only Thing I did, is changing the heel sole and sole when they were down. It is still water resistent and the leather is still supple and soft. I am trying to order other pairs of this boot. I received these as a Christmas gift. I am a picky person when it comes to footwear so it is saying something when I say these boots look great and wear exceptionally well. They feel almost broken in straight from the box. The EE width is perfect for me. I am sure the will be with me a long time. I Lived In These Boots ,Walking, Sliding, Spinning,Dancing, & Working. I purchased these boots at Cavender's in Waco a couple of months ago. I still own two pair from thirty years ago -- a smooth Ostrich and a Water Buffalo. 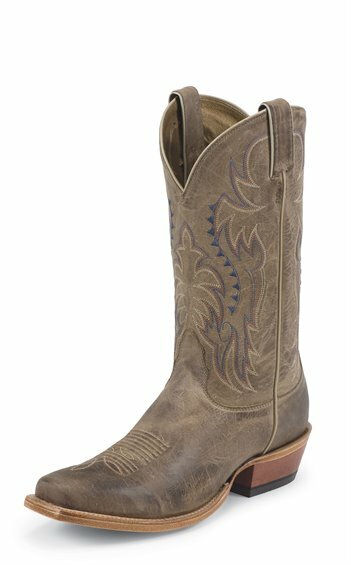 Nocona has always fit well, and these boots fall right in line! This is my fourth pair of Nocona Boots, and I pray not my last. The first pair (Chocolate/Black bull shoulder) are 25 yo and still are worn frequently. They have been resoled several times and still look like new. Dittos to a soft tan ostrich quill and a black cayman dress boot. All fit as if my foot is the model for the form. This pair outdoes all the others in fit and comfort. I like the square toe and the heel especially. I think the square toe shape allows slightly more toe space than all my other Noconas, and that adds to the comfort level. Nocona boots do it all for me. My 25 yo bull shoulder boots have been worn on construction sites and my black hornback caymans have an incredible shine and are worn with my tuxedo. A wonderful testimony to your bootmaking skill. Thank you!! I got these boots as an early Christmas present. First pair of western boots I have worn since I was a little kid. I was ready for them to be uncomfortable for a few weeks until they go broken it but felt great after a couple of hours. I am amazed by how comfortable these boots are and by how great they look. Hope they last for years. Had for over a year and nothing but great comfort and look. Bought for dress boots but loved the comfort and eneded up being work and everyday footwear. The fit is second to none, purchasing my third pair today. I bought this boot as a serious riding boot, and wanted a leather sole. Boot fit perfectly from the start, but then when my horse stumbled and went down hard, the leather soles saved my bacon as I was able to slip out of the stirrups and not get hung up. This is just a great boot. I've moved Noconas to the top of my list over Tony's, Justin, Rios and A Beans--all fine boots. I'm looking forward to putting over 100 serious miles with these boots in the stirrups in the upcoming Roundup Riders of Rockies Big Ride. Great fitting boot. The leather all around is very soft. No break in time needed. Comfy fit from day one. Noconas are the best. Great fit and comfortable. Great for all day wear:) They are the only boot I will ever consider for purchase in the future. Great looking and the fit is perfect! I went into a large Texas boot store, shopping for my first western boots, certain that I would buy Justin boots. I tried on Nocona Boots and loved the way they fit right away. I kept trying on others, expecting to like others better - but I never did. Wore them to dinner tonight and they were super comfortable the whole time. No discomfort at all!